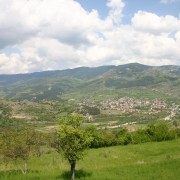 Located in the beautiful central Rhodope mountain, near the village of Hvoyna, among forests, rivers and mountain trails, conveniently close to winter and spa resorts, natural and places of historical interest, the plot is perfect for developing a residential village, a brain-storming centre, a retreat centre, a scout centre, an alternative medicine centre, etc. A residential village project has been developed for the plot — Green Village, comprising houses, an apartment house, a hotel, a restaurant, a spa centre, etc. Budget: Please contact us for information.